Have you ever seen a "murder" of crows? As strange as it sounds, this is the way crows have been described as far back as the 15th century. It isn't as bloody as it sounds. Some suggest that this term is derived from the sound made by a bunch of agitated crows all cawing at the same time. I have another thought on the matter, which may or may not be accurate. I think it could be because flocks of crows are murder on a freshly planted crop of seeds. 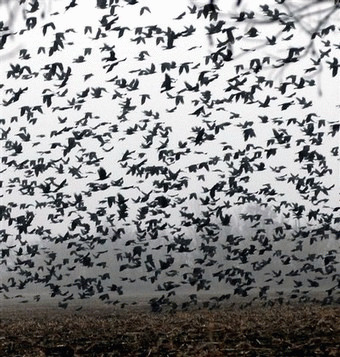 Imagine that you are a farmer who has just finished planting your field and a huge flock of crows shows up to devour the seeds. You may find yourself mumbling the words, "You murdering bunch of crows." Or, "If I get my hands on you I'll murder you, you stinking crows." You get the idea. Be that as it may, I am writing this because, for the past week or so, a "murder" of crows has been congregating in my neighbor's trees. It is truly astounding to see. There must be between 200 to 300 crows in this "murder." Once they all take flight, they blanket the sky above me and I find myself hoping they don't all unload as they fly over my car. I tried to listen to their calls to hear the sound of 'murder' but could only distinguish their familiar cawing. They do not appear to be eating any fruit from the trees, as these are just your normal shade trees. Why they have taken up residence in these particular trees is unknown. As I watched them, I am reminded of another amazing bird occurrence that happened nearly ten years ago. A sight I had not seen before and have yet to see again. I was living in Manassas, Virginia at the time and was standing on the balcony of my apartment. I noticed what appeared to be a "river" of birds streaming across the sky. What made this such an amazing sight is that there appeared to be no beginning and no end to this river. As far as my eye could see this river stretched across the sky going from south to north in a steady undulating line that had no beginning and no end to it. For hours, I watched, wondering from where these birds came, where they were going, and why? In my entire life, I have never seen such a sight. Nor, could I identify the type of birds that had gathered together in this mass exodus. I can only say that they were perhaps the size of starlings. Being silhouetted against the bright midday sky made it impossible to see any particular color other than dark. This picture is merely for illustration and does not properly show the magnitude, the awe of which will stay with me for the rest of my life. If you can visualize these birds tripled or quadrupled, you may get an impression of what I saw that summer's day back in 1997. It was as if someone had gathered every bird from the world and directed them to fly to some undesclosed place. This river of birds snaked its way across the sky spanning at least ¼ mile in width and mile after mile after mile in length. Throughout the day, they flew past my apartment balcony and I found it difficult to tear my eyes away from the sight. It would be difficult trying to guesstimate exactly how many birds made up this river. To limit the number to hundreds of thousands sounds so small when I remember how long this river lasted. It could have been millions for all I know. What made this even more amazing is the fact that nowhere on the news was this even mentioned. Don't people ever look up anymore? How could this sight have been missed? Indeed, it appeared to have been missed by everyone but me and my roommate and that is only because I physically dragged him to the balcony. He viewed the sight with suppressed amusement and returned to the sofa to watch TV. His apathetic attitude reflects that of the rest of the population apparently. Nature surrounds us with many mysterious signs and symptoms that go unnoticed by the majority of humankind nowadays and it's a shame as there is so much to be learned from our furred and feathered friends. With the invention of technology all humankind has been caught up with its temptations and no longer feel it's necessary to see things in real life, preferring, instead, to see a rerun on TV. A gigantic UFO could land in the back yard and no one would notice, their noses firmly planted in the latest techy device. What a shame. Is there any doubt as to the reason that the world around us is crumbling, the damage going unnoticed, and all the while, the general population goes about their daily lives totally oblivious of any difference. Technology has its place. But, there is also a time to put these techy things down and pay attention to the world around us. We cannot ignore nature. To do so will undoubtedly bring about our own destruction. I would love to find out if anyone has ever seen such a sight as this and if you have any particular knowledge of what would make these birds take to the sky in this way and in such numbers. I ruled out migration. They were headed north and it was in the middle of summer, with plenty of food for all. However, I am not an expert in such things. And humbly admit this. But, I love to learn new things, especially the things that involve nature. I'd love to hear from anyone who may have an idea about what was happening here. Feel free to express yourselves.